I’m using Array Formulas to find the last filled or the last non empty cell ,it’s the same :). Important: Each formula must be confirmed by Ctrl+Shift+Enter (not just Enter). This formulas are for the entire column. Cell A1 is fixed and A12 is optional. If you need another column, just change letter A in the formula. The advantage of this formula is that it works in all Excel versions. The disadvantage is that the searched range must start in the first row (A1, B1, C1, …). This works only in Excel 2007 and higher (Excel 2003 displays #NUM! error). From a practical point of view is not very convenient to search the entire Excel column. 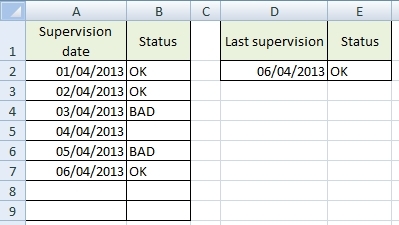 We want to find the last filled cell in the first and the second column of the table. If you see some number instead of the date, just change the cell format to Date. This works for all Excel versions. I note that it is necessary to confirm the formula with Ctrl + Shift + Enter. The table contains prefilled values in the first column. We want to find the last record having Status. This formulas are for the entire row. Cell A1 is fixed and Z1 is optional. If you need another row, just change number 1 in the formula. The advantage of this formula is that it works in all Excel versions. The disadvantage is that the searched range must start in the first column (A1, A2, A3, …). We want to find the last filled cell in the first and the second row of the table. Note: it is necessary to confirm the formulas with Ctrl + Shift + Enter (array formula). The table contains prefilled values in the first row. We want to find the last record having Status. Nice post. I have a further issue. Talking about Formula for the table row / example 1 and 2, suppose we are looking for a non standard/fixed value (loke “OK” or “BAD”) but we need to find a number that could be also repeteable (like, 1,3,2,3,4,5, ,6,2,,, and so on) how I can it? 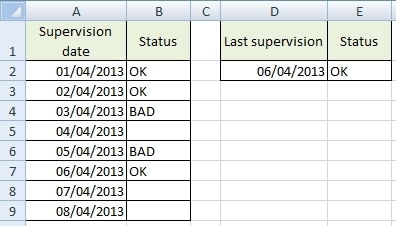 If it is not clear you could just replave the last OK and BAD with some numbers and find last cell was filled in the row.